There are tons of different types of Dudleya. You could make your gardening life a study in them alone. I snapped this shot at the Los Angeles Cactus and Succulent Show and Plant a few weeks ago. You can find all my pictures from the show, and a montage video, in these earlier posts on A Gardener’s Notebook. 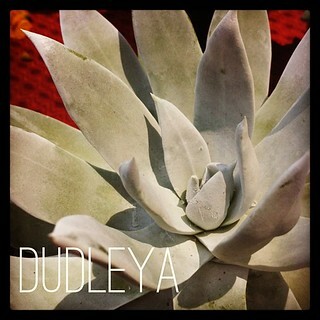 “Dudleya is a genus of succulent perennials, consisting of about 45 species in southwest North America. Many plants in the Dudleya genus were formerly classified as Echeveria. The fleshy and glabrous leaves occur in basal rosettes, in colors generally ranging from green to gray. The inflorescences are on vertical or inclined stems up to a meter high, but usually much shorter, topped by a cyme with alternate leaf-like bracts. Both the petals and sepals of the small flowers are five in number and fused below. Five pistils, also fused below, have 10 stamens arranged around them. Dudleya species are widespread in their range, typically found in rock outcroppings, cliff faces, or road cuts, where their leaves help them store water in a setting too dry for most types of plants. Most are small and inconspicuous when not in bloom. The genus is named after William Russell Dudley, the first head of the botany department at Stanford University. Categorized under: Cactus, Education, Garden Alphabet, Horticulture, Photos, Plants, Succulents.